The Office of International Student Services (ISS) provides services and advocacy for international students. The ISS office offers assistance with USCIS (formerly the INS) procedures, particularly for visa status maintenance and employment options. Additionally, it provides pre-semesterorientation for new students, adjustment workshops for continuing students, and re-entry workshops for graduating students. The office also coordinates access for international students to both University and external resources, for insurance, banking,social security, and daily life needs. In addition, the Office of International Student Services moderates the activities of the International Student Association (ISA). 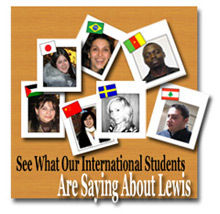 The ISA seeks to foster an awareness of other cultures at the Lewis University campus, promote friendships between international students, as well as with American students, and providesupport and appreciation for the international student community at Lewis University. It accomplishes thisby providing special programs and opportunities for social interaction and constructive culture exchange. All programs and activities are non-political in nature.